With Malice Toward None --------- by Lee Harris: Isn't Life Grand? Surprise surprise! I got out of the house by myself the other night. That, itself, is a minor miracle. We are somewhat joined at the hip and I still managed to go out, eat, talk with friends on the Plaza, and find myself talking to a 7th grader from Chicago. After the interview, the boy's mother told me that what I said was what a lot of people say about living in Ajijic. Nope, I'm not unique in my reasons for dumping the condo, car, and most of what we owned. Don't look for really rational reasons for uprooting and transplanting ourselves several thousands of miles south. We no longer have all the expenses associated with home ownership. No condo fees, no incompetent and criminal condo board to stress over, no condo insurance, etc. We don't have to repair an old car, pay for insurance, vehicle registration, etc. And, our lives are no longer cluttered with multiple TV's, electronic equipment, old toys, and crap we rarely used. Instead of the noise from the eighteen wheelers on the Blue Water Bridges we occasionally hear a truck grind gears to get uphill or squealing brakes as it goes downhill. We get to listen to roosters, the clapping of horse hooves, vendors, and, when desired, absolutely nothing. We love learning Spanish, the food, the cost of living, the food, the people, the food, the climate, the food, the beautiful surroundings.... Did I mention the food? Yep, I'm feeling great about the decision to move. My general mood seems to be stable at the moment. Replacing Lamictal with Criam was a good move, too. Criam is a tablet form of valproic acid that is used in treating epilepsy, just as Lamictal. (In Spanish, Criam is valproato de magnesio.) I still take Welbutrin, vitamins, fish oil capsules, and the usual blood pressure and thyroid medications. We've added another drug finding multiple uses – Provigil. All is well. My psychiatric cocktail seems adequate for now. 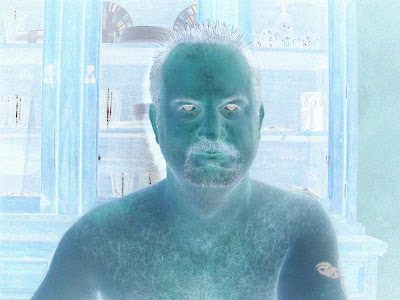 That's Billy, above, shirtless and sitting at the computer – in negative. I love my $99 camera. I'm still discovering all the kewl things it can do.